I recently bought my mirror first powders!! I know they all say "use with gel polish", but rules are there to be broken, right?? Or at least this one! I had seen some video's online about using water based top coats and had to see for myself if they worked. Long story short: they do!! 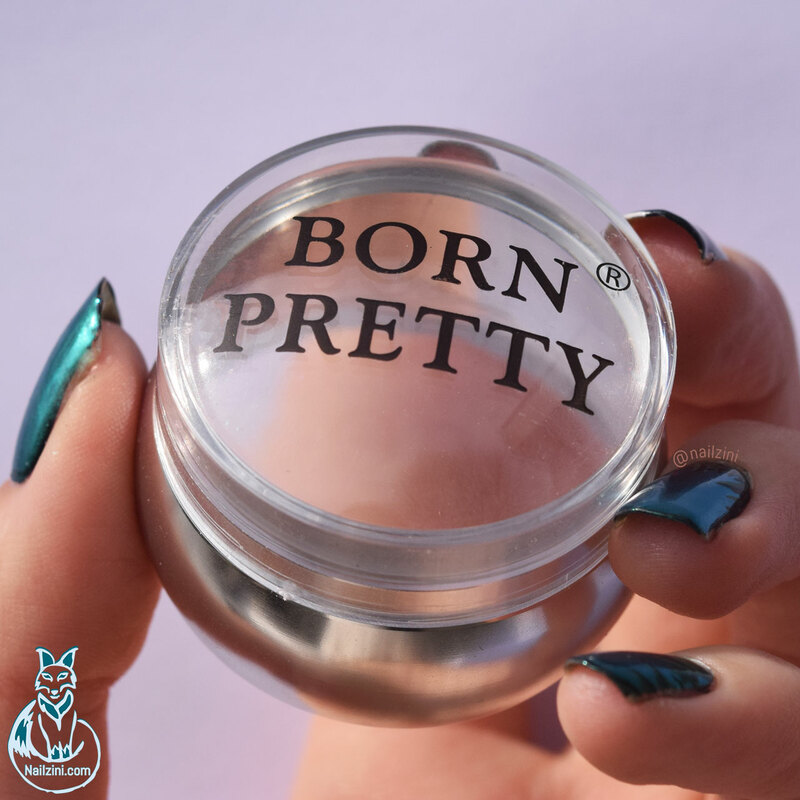 Here I'm using a pearl powder by Bornprettystore. 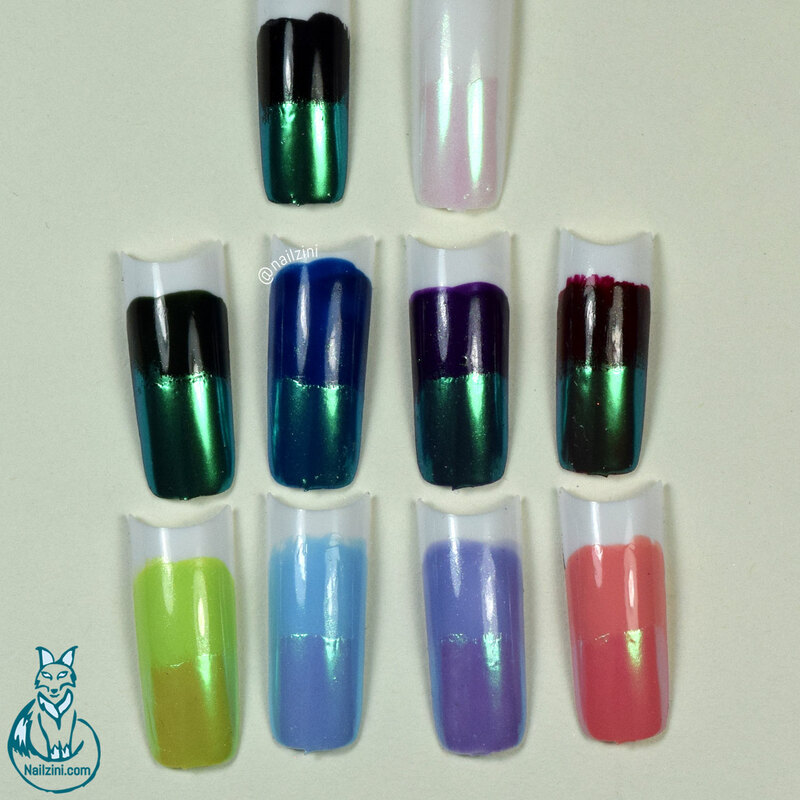 On top of light colors if gives a pearl effect, but on top of dark polish it becomes a green mirror effect! I'm absolutely in love with the different uses for this powder! In the picture below you can see with it looks like on different colors. For this design the green mirror effect was a perfect combo for my new adorable panda plate so I went with a Black polish, "neo-noir" by H&M, as the base. Then I applied one coat of "Miracle Gel Top Coat" by Sally Hansen and rubbed the powder on. I let the polish dry completely and the applied one coat of "Ready for Takeoff" peel off base coat by Unt. Let that dry again and then I used "HK Girl" by Glisten&Glow. Lastly I stamped some bamboo on the mirror nails, first with a dark green polish and then with a light green, and applied another top coat. 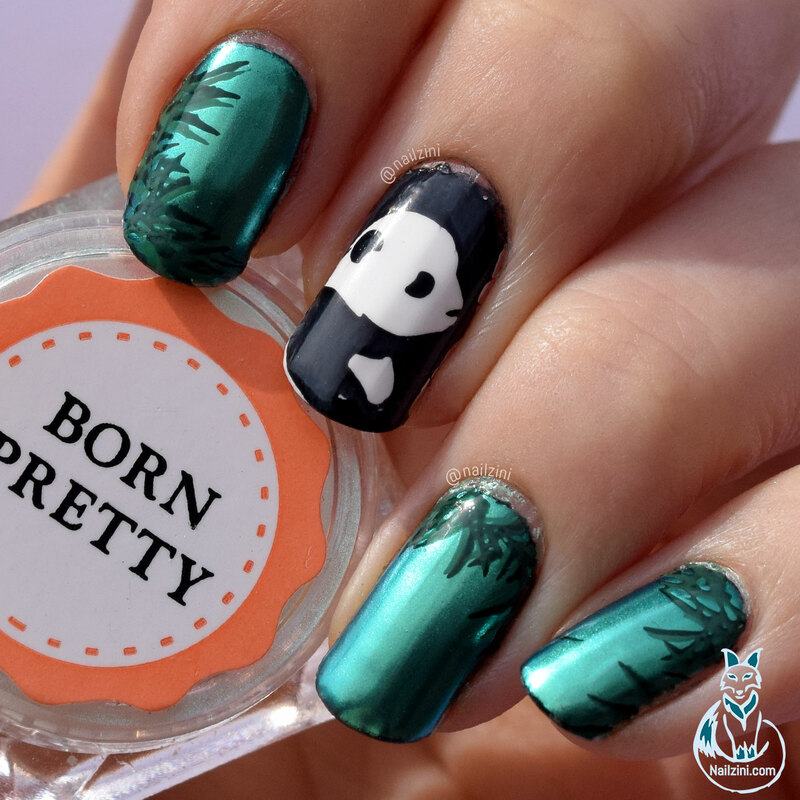 The panda accent nail was stamped with "Neo-Noir" by H&M on an opaque white base. With normal polish wait until it's almost completely dry and then apply the powder. You don't need to be gentle for this one! I actually prefer to use my finger to rub the powder on normal polish, I feel like it works a bit better. For the top coats, the miracle gel top coat is the worst, but normal top coats seem fine. For this design I used my new mini metal clear jelly stamper (ID=37901) and I love it! Even though it's smaller than the regular sized one, it's a lot heavier since the side is made of metal (aluminium alloy). Because of the metal you can't look at the design from the sides, but you can still clearly see from above which is more than enough for me. One huge advantage of this shorter one is that I can zoom in more when filming so it's easier to see the design being stamped. It picks up patterns perfectly! Like with other clear jelly stampers you only need a light roll over your stamping plate to pick up the design. When applying too much pressure, it doesn't pick it up well. To clean the stamper I use a lint roller or scotch tape to avoid damaging the stamper head. Besides the silver one I have, they also have them in blue, gold, rose-gold and clear. This adorable panda plate (ID=38221) came with a gorgeous cover to keep the plate safe when it's stored away. 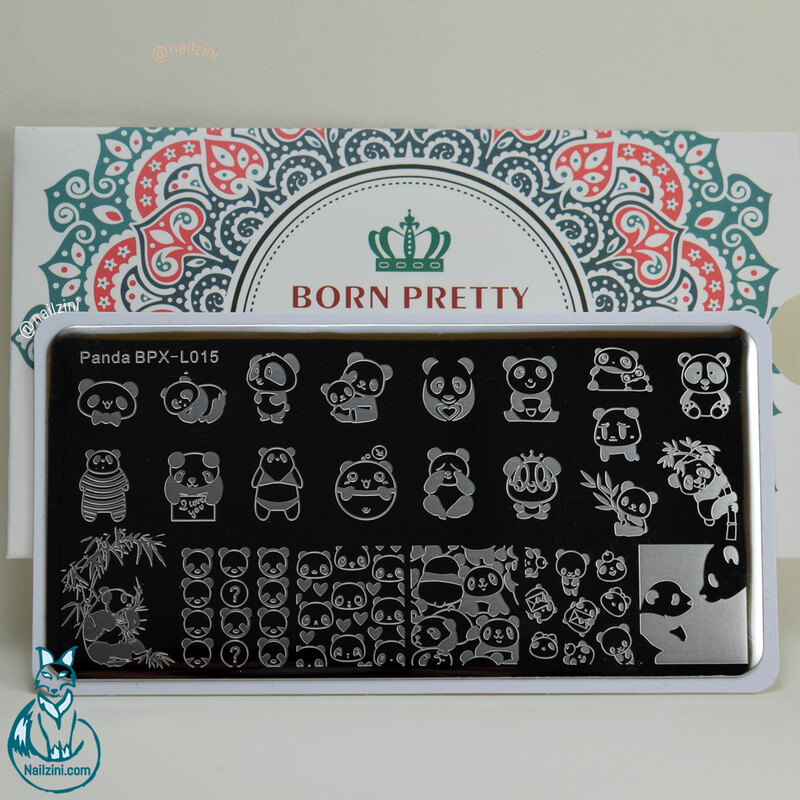 As you can see in the picture above, the plates comes with a lot of different panda designs. 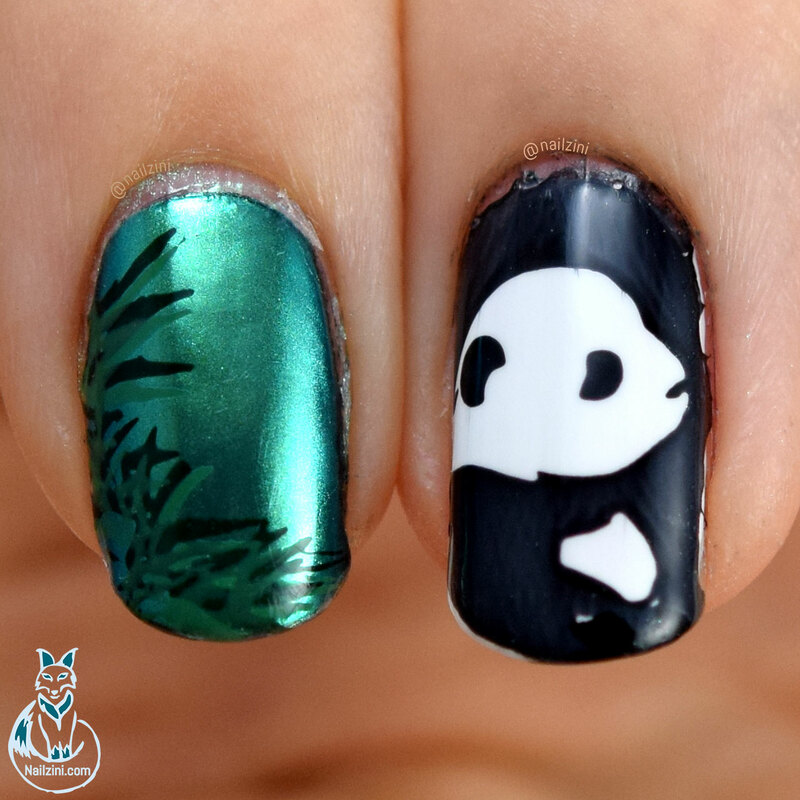 There are some full nails designs, cute cartoon style pandas, and realistic looking pandas. All of the designs are very easily transferred onto my stamper, except for the one I chose for this design on the bottom right. Because it has a lot of open space it's hard to only scrape of the polish you want without also scraping off some polish inside the open space. 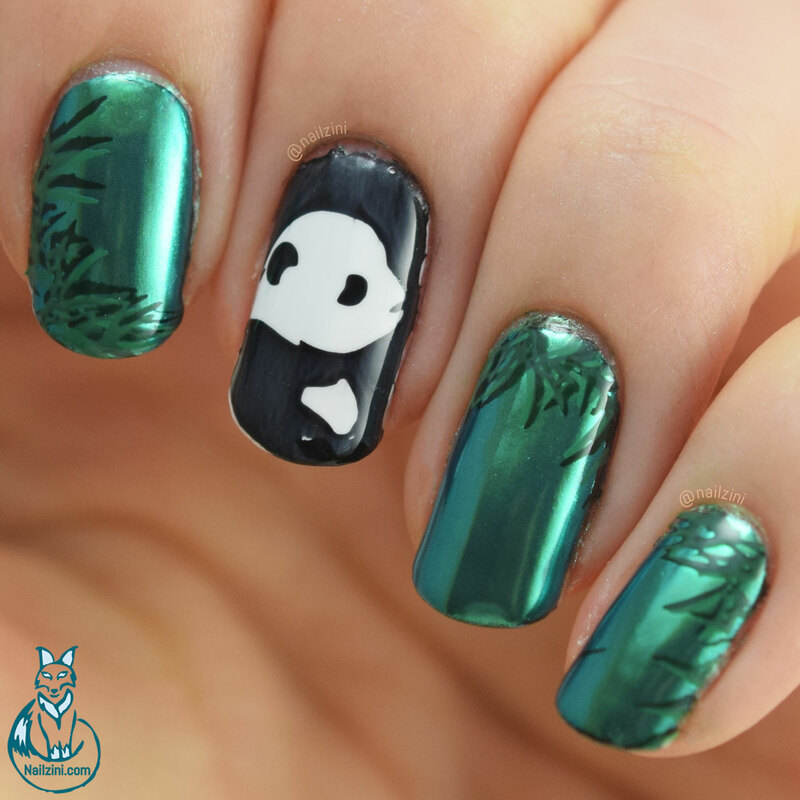 It's also a very big design and while I initially wanted both baby and mommy panda on my nail I could only fit baby panda on my thin nails. I think it still look amazing though!! While it took me quite a long time to get a perfect stamp of the little one, I did figure out that scraping diagonally makes it a lot easier. There's less chance of scraping away too much polish when doing it that way. 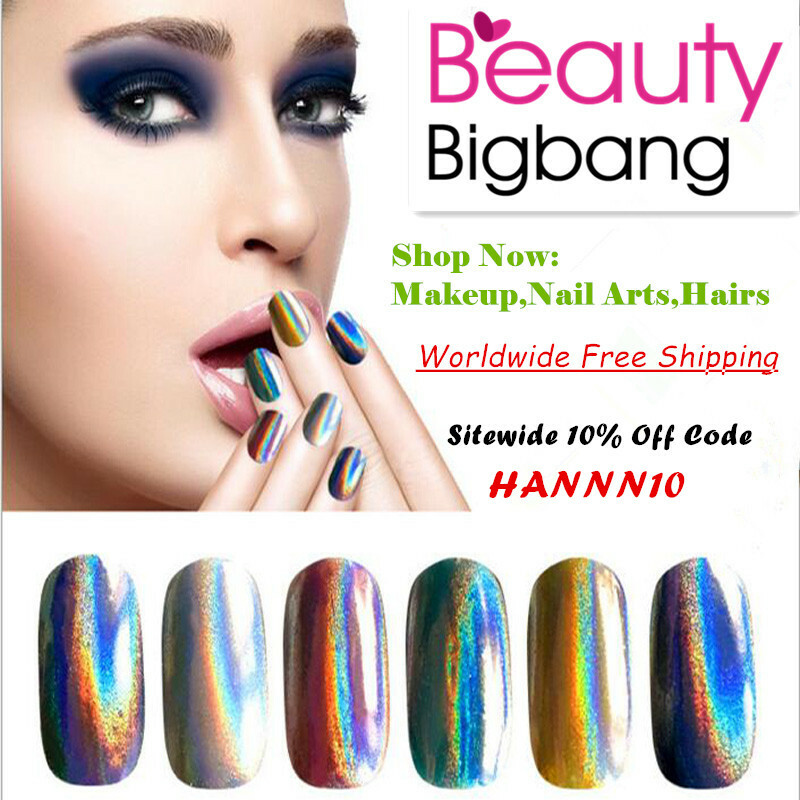 Another thing is if you picked up the design on your stamper, but there's a little bit of black on the face, you can use a toothpick or small brush to gently dab of the excess polish. You can see what I mean in the tutorial below. That said unless you really want that pattern, it's better to use all the other adorable, and way easier to stamp, designs.